The market for natural gas in the northeastern U.S. is out of balance. There is too much supply in northern Pennsylvania and too much demand in New England. As a result, those producers are being paid much less than their consumers are paying. One solution is to add pipeline capacity, in order to ship the gas east. Map of a distribution system for natural gas showing regional pipelines, including the proposed Northeast Energy Direct or “Proposed Pennsylvania to Wright, NY Route” (broad dashed gray line) and “Constitution” (narrow solid black line). Where the two would be co-located, only gray line of NED is shown. Compressor stations are shown along the pipelines, including existing (light gray squares, labeled “STA. #”) and proposed (medium gray squares labeled “New C/S” or “Head Station”). 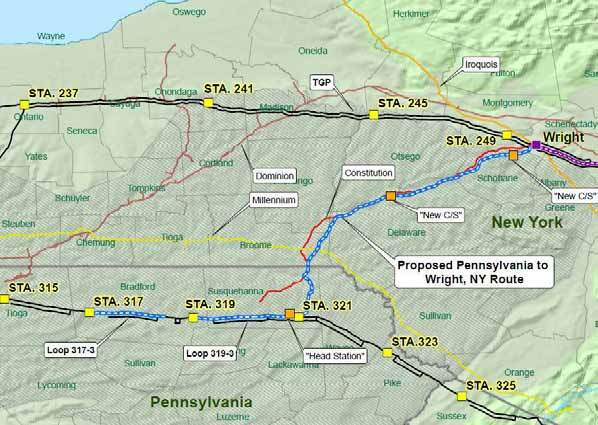 In the fall of 2011, the Tennessee Gas Pipeline Company, LLC proposed a new thirty-six inch gas pipeline to run between two of its existing pipelines, from Brooklyn PA through Franklin to Wright NY (see NFR, Spring 2012) — only to abandon this Northeast Exchange project a few months later. TGP never would say why they abandoned the Brooklyn/Wright line, but it was being bought by Kinder-Morgan Energy Partners, LC. At any rate, Williams Partners, LP took over that route by proposing the Constitution project (see NFR, Summer 20122). In the fall of 2012, TGP proposed the Northeast Expansion project, a gas pipeline from Wright NY to Dracut MA. In the recent solicitation to suppliers (February 13 to March 28), TGP proposed a capacity of this Wright/Dracut line of 0.6 to 2.2 billion cubic feet per day (Bcf/d). Because they are going forward, presumably TGP signed up enough supply, but we don’t know how many did. For more than a year, it seemed as if TGP was content to plan for the Constitution Pipeline to supply gas to the input of this Northeast Expansion Pipeline in Wright. But the Constitution would supply only 0.6 to 0.8 Bcf/d. As a result of interest from Pennsylvania’s gas producers, TGP has revived plans for the Northeast Exchange. Originally it was to have a 0.6 Bcf/d capacity, but with no booster compressor station. Now, the recent plan adds just such a station somewhere in Delaware County, which would increase capacity. If built, such a booster compressor would be located around the middle of the route. Currently it is planned for the North Franklin or west Davenport area, east of State Highway 28. Additional compression engines would have to be installed at existing compressor stations at the input in Clifford PA and the output in Wright NY. Compressor stations make poor neighbors, polluting the air with noise and chemicals. The compressors spin 24/7/365, and the occasional venting sounds like a jet taking off. The small leaks and huge volumes of vented shale gas have been linked to a variety of signs of chemical poisoning such as headaches, dizziness, nausea, nose bleeds and rashes. Together, the Northeast Exchange (southwestern half) and the Northeast Expansion (northeastern half) is being called the Northeast Energy Direct or NED. The southwestern half of this project, including the section through Franklin, has not even been pre-filed with the Federal Energy Regulatory Commission. Of course the same was said about the Constitution Pipeline back in 2012. In New York, the new TGP route is almost identical to the original one, but both show some differences from the Williams route of the Constitution. All three take a very similar path through Delaware County. If both pipelines are built, their ill effects double. At best, a second strip of easements would double the width of the easement corridor and at worst, create two separate parallel strips. Construction in 2015 and then in 2017 would take twice as long. Wear and tear on roads would double, as would traffic congestion. Tax assessments of infrastructure and easement payments would likewise double, but this would be offset by decrease in assessments of affected parcels. Affected land owners would be twice cheated of fair compensation. And while there has been some talk of local distribution of gas, two pipelines would not make such a supply twice as cheap. Currently the timeline is: taking bids from potential suppliers of gas – February/March 2014; contracts signed by suppliers – August 2014; and submitting an outline of the project to FERC (pre-filing) – September 2014, with the aim of beginning clearing brush and trees from the route by January 2017 and starting to ship gas to consumers after November 2018. Already along the pipeline route, affected landowners are receiving letters from the TGP subcontractor, The NLS Group, seeking permission for surveys. At least TGP has the honesty to admit that a booster compressor is necessary, unlike Williams. Also they are clear that possible users of this gas could be “developers of liquefied natural gas (“LNG”) projects in New England and Atlantic Canada,” unlike Williams. Once a utility corridor is established, it is easier to co-locate more utilities along it. But here we have an adjacent easement being proposed before the first is even certified by FERC. What does this portend for our future?